I'm in South Florida for the next few weeks and, as is my habit, I walk on the beach every morning. 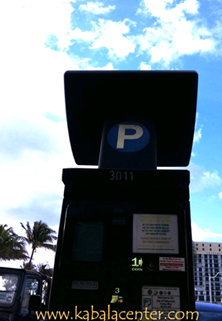 The city recently installed a new street parking system replacing individual meters with one master meter. Feed it money, buy some time, get a ticket and put it on your windshield. Nothing unusual but today I looked at the master meter more closely. On top of the meter is a rectangle that contains a transmitter which sends a signal to a satellite to process your credit or debit card purchase. 24 hours a day, the meter sends its signal upward. We should emulate the meter and send more signals into the heavens. Right now, look up toward the sky and send a positive thought to G-d. Ask for something. Express how you feel. G-d is listening and the more you send your signals, the more you will be heard.